The 34-year-old father was rushed to hospital after being beaten with metal bars. 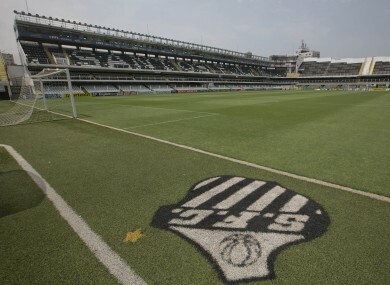 Vila Belmiro stadium, home of Santos FC. A FAN OF Brazilian club Santos died yesterday after being beaten up as he left a league match in Sao Paulo, which will host the opening match of the World Cup. The 34-year-old fan was attacked by some 15 fans, who beat him with metal bars at a bus stop following a match between Pele’s former side Santos and Sao Paulo. Media reported another supporter, aged just 15, was in a serious condition after being attacked at a metro station. The club said it abhorred “acts of violence which, sadly, result in victims, one of them fatal” in this instance. Globo telvision said the victim, Marcio Barreto de Toledo, had been with two other Santos fans who managed to flee as he was set upon. “I think they only stopped hitting him when they got tired of doing so, not because somebody showed up,” Globo quoted the victim’s wife, Samanta Ferreira dos Santos, as saying. The couple had a five-month-old baby. Toledo died in the early hours after being admitted to hospital after Sunday’s goalless draw. Globo said no arrests had been made by Monday evening in connection with the killing. Brazil, which will host the World Cup between June 12 and July 13, has been beset by repeated incidences of violence at matches in recent months. Fans of Corinthians burst into the club’s training centre last month and tried to strangle Peruvian striker Paolo Guerrero and threatened to break the legs of former striker Alexandre Pato, who promptly left the club in a loan deal with Sao Paulo. In December, images were beamed around the globe after fans of Vasco de Gama and Atletico Paranaense clashed violently, leaving one fan needing to be airlifted to hospital from the pitch. Brazil and world football’s governing body FIFA insist nothing will be left to chance regarding fan security at the 12 World Cup venues. Last week, authorities and FIFA revealed a total of 170,000 security personnel, including 20,000 private security professionals, would be deployed in a tightly integrated security matrix. Email “Brazilian football fan beaten to death after league match in Sao Paulo”. Feedback on “Brazilian football fan beaten to death after league match in Sao Paulo”.